Tip #20 – Leave plenty of time for your wedding photographs. 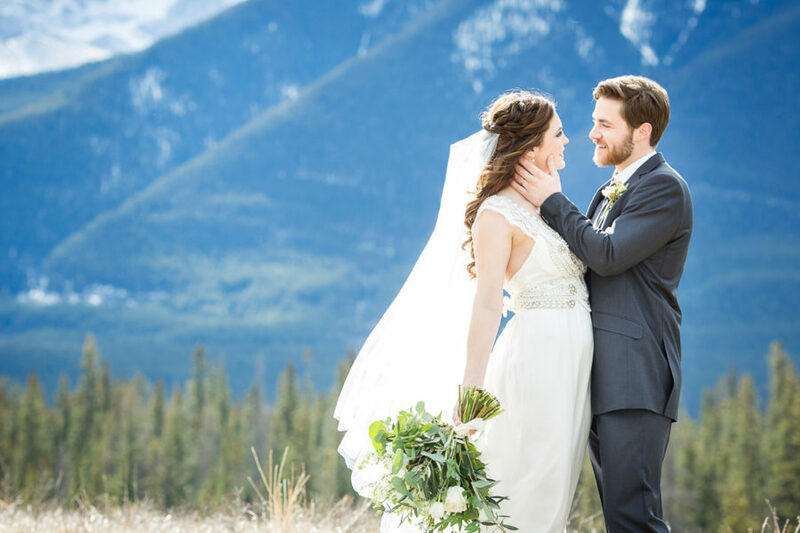 One of the main attractions of having a wedding in the Rocky Mountain areas of Banff, Canmore, Lake Louise and Jasper are the beautiful surroundings; snow capped mountain peaks, turquoise blue lakes, trees and alpine meadows. These areas are truly some of the most beautiful and awe-inspiring places on the planet. A wedding in such incredible surroundings will undoubtedly provide lasting memories. 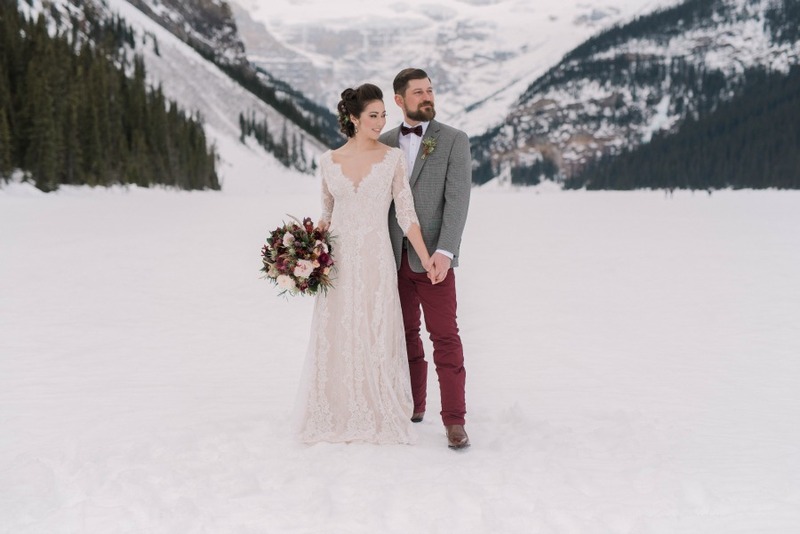 You’ve opted for a scenic mountain wedding with good reason; choosing a natural environment for your wedding photographs will provide beautiful, lifelong memories. The mountains are a paradise for photographers and you’ll want to ensure your photographer captures it all. Therefore, its important to leave plenty of time to have your photos taken after the ceremony. Mountain towns are a popular tourist destination, especially in summer. 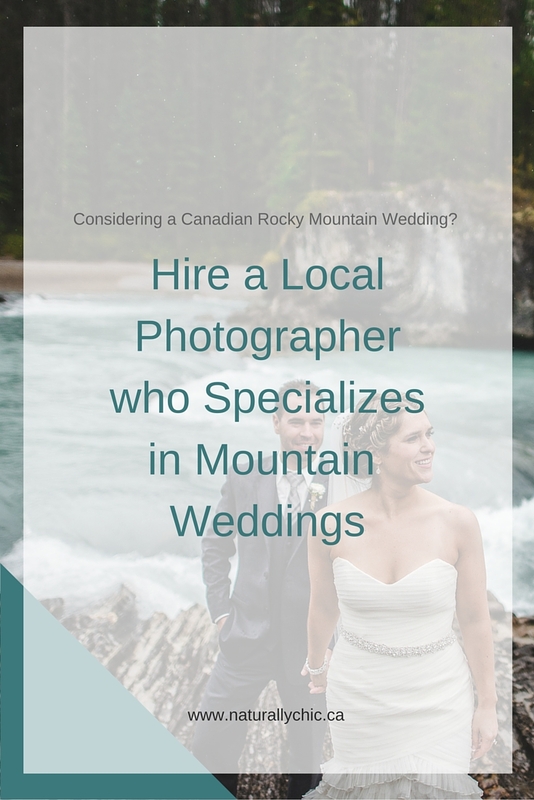 If you’re getting married in the town of Banff, in particular, you’ll want to schedule in a little extra time to compensate for traffic and pedestrians if you’re wanting to take photos in more than one location. Holiday weekends are generally the busiest, but festivals and events can also yield extra traffic. Local photographers are a great resource as they usually know what events are taking place in town. They know the area well and can provide lots of good options for photo locations. Large group shots and family photos are best taken at the ceremony site (no traveling required). After family photos are taken, couples often want to have photos taken around town or in the surrounding areas. This generally means a few cars are necessary for the couple, the wedding party, the photographer and other assistants. It can be difficult to keep an entourage of cars together with traffic lights and pedestrian crossings, so it’s a good idea to select a few locations in advance and ensure the driver of each car knows how to get to that location. If you’re wanting to take photos at several locations, you’ll definitely need to schedule in more time. A longer photo shoot also means more time for your guests to explore area, have a rest or get something to eat before your reception! If you don’t mind breaking tradition, you may even want to consider taking photos with the wedding party before the actual ceremony. This way, you’ll have plenty of time to get all the shots and still have time to freshen up before the ceremony. Of course, this option isn’t for everyone! If it’s not, then its a good idea to have someone keep track of the time on your photo shoot. Your wedding planner’s assistant or photographer will usually handle this task. They’ll help keep you on schedule and ensure you arrive in time for your own reception! Be sure to leave plenty of time to freshen up prior to your reception especially in hot, windy or rainy conditions. You may even need to have your hair or makeup touched up. Consider packing an extra pair of comfortable shoes to wear under your gown, especially if you are planning on getting a few shots in more remote locations. Consider sending the bridal party back early from the photo shoot so they can enjoy your cocktail reception. Bring along water and snacks to help keep you hydrated and your energy up. Mist bouquets with water periodically. Carry cell phones and check in with your wedding planner so they know when to expect you at the reception. Carry umbrellas and warm blankets or clothing (just in case). You will be so pleased you saved plenty of time to take your wedding photos in the beautiful, splendor of the rocky mountains! Contact us at Naturally Chic 1.888.679.9056 or at info@naturallychic.ca for help with planning your Rocky Mountain wedding. 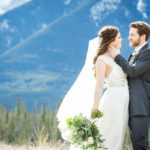 If you’re planning a wedding in Banff, Canmore, Lake Louise or Jasper, aside from the stunning scenery, one of the main attractions of visiting a National Park is the wildlife. If you’re planning a wedding in a National Park, it’s important to consider the safety of you and your guests at all times, especially if you’re going to be married off a hiking trail or in a remote area. Even if you’re getting married at a luxury resort in Banff, you and your guests may still come in contact with wildlife. All of your guests may not have visited a national park before or experienced wildlife at close proximity. Consider educating your guests on what to do to safely enjoy and observe wildlife. The National Parks are home to many species of wildlife large and small, including: elk, bear, moose and deer and it’s important to respect the animals in their natural habitat. Even though the animals may appear quiet and accustomed to people, they are still wild animals and a potential threat to humans. So what can you do to help protect both your guests and the animals? One idea, is to include a printed pamphlet on wildlife safety tips in each guests’ welcome package or put safety tips on your wedding website so guests know what to expect before they arrive at your wedding destination. If you have lots of guests who have never experienced the National Parks before, consider setting up organized tours and activities so your guests can experience the beauty of the parks in a safe manner. There are even tours set up specifically for wildlife viewing! Be aware of and respectful of wildlife. Drive cautiously and observe park speed limits. Slow down if animals are on or near the road and be aware that they could suddenly run across the road or change direction. If there is one animal in sight, there may be more waiting in the trees to cross the road and could run out suddenly. Keep your distance from wild animals (including bear and elk). Never approach wildlife. Try not to disturb them and if you feel you must take a photo stay in your vehicle and use a telephoto lens or binoculars to observe. Do not litter. There are bear-proof garbage recepticles located throughout Banff National Park. Food attracts wildlife and animals could become a nuisance or threat if they become dependent on human food. If you see a young animal, remember that their protective parent is likely not far away. Mating season and birthing seasons can bring out aggresive nature in wildlife. When hiking stick to marked trails and make noise to alert animals you are nearby as they will generally keep a natural distance from humans. Observe and respect trail closures and advisories alerting hikers to potential animal threats such as grizzly bears. Do not stop on the side of the road and get out of your vehicle to take photos. It’s illegal in Canada’s Parks to do so! 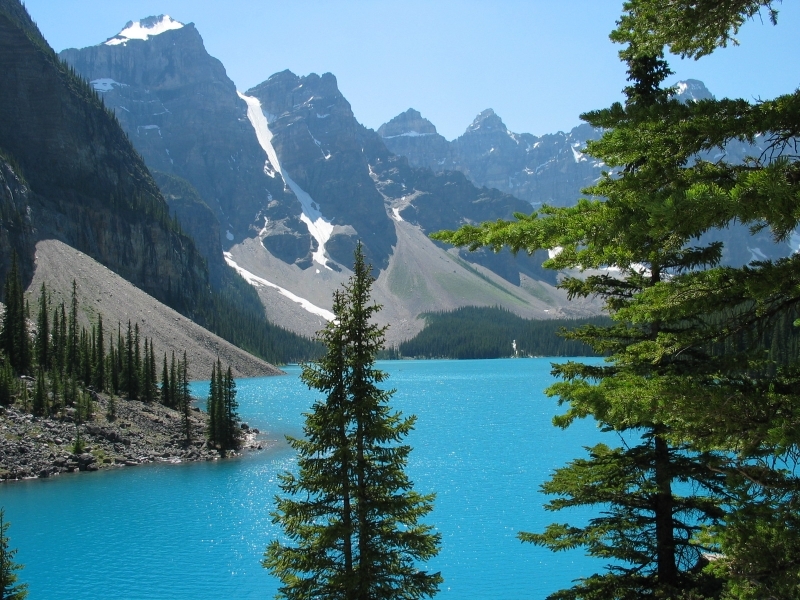 For more information on visitor safety please check out the Parks Canada site. 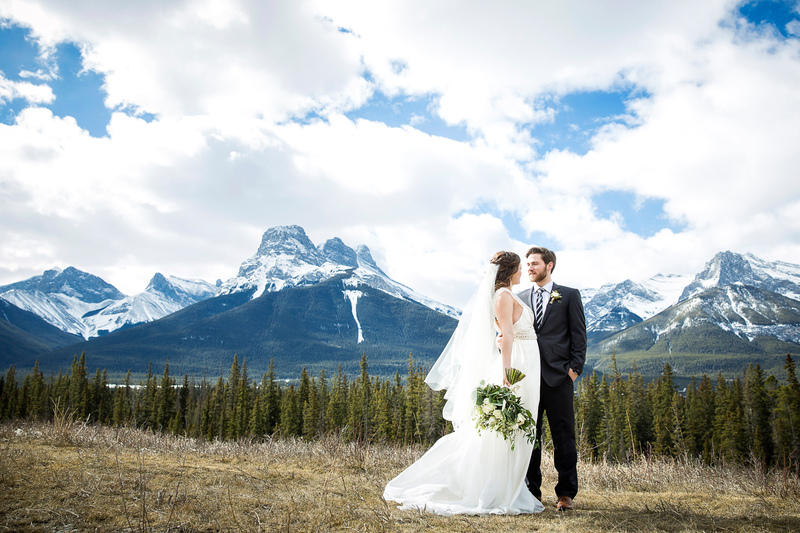 For help with planning a wedding in Banff, Canmore, Lake Louise or Jasper, call Naturally Chic 1.888.679.9056.